Rahul Bhat, Richa Chadha starrer 'Daas Dev' trailer is out but does it get Devdas right? 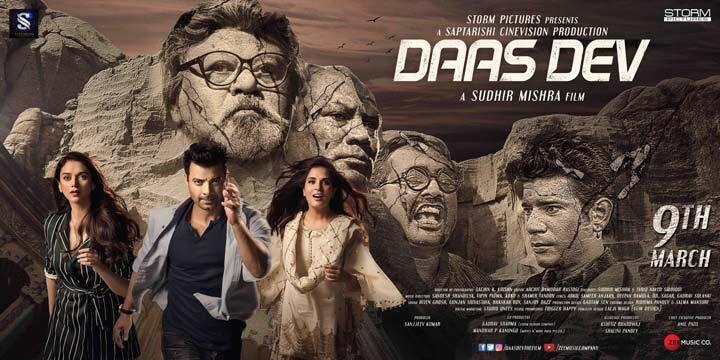 Home » Entertainment » Rahul Bhat, Richa Chadha starrer ‘Daas Dev’ trailer is out but does it get Devdas right? It is Sudhir Mishra’s turn now to adapt the classic novel Devdas but in the modern day political scenario of gut and wrench. It has been a long overdue project for Mishra but he found his Devdas as Daas Dev in Rahul Bhat who was last seen in Anurag Kashyap’s ‘Ugly’ in an important role. The moment one takes the earnestness of Devdas’s character that he has for his lover, it just becomes another love triangle of some kind, which is what Kashyap did in Dev D and Mishra is repeating the same trait. If one does not want the purity of Devdas as rightly showcased by Sanjay Bhansali and Shahrukh Khan in 2002 epic than what could possibly the point of using that name perhaps only for marketing and the big minus is that story of the film becomes predictable. Mishra has altered the whole personality of this character into a morally corrupt being who is after wealth, power in politics till he finds himself in love with a prostitute called Chandni and desperately sees his lover portrayed by Richa Chadha go away but is this enough to adapt this classic. Saurabh Shukla portrays the character of Rahul Bhat’s father who is showcased as an antagonist in the film though in the novel, Devdas is his biggest enemy and liquor the next. Mukkabaaz famed Vineet Mishra portrays perhaps the character of Chunni Babu but instead of Jackie Shroff’s version who was a friend to Devdas, Vineet abuses the hell out of Daas Dev. This adaptation is even more twisted than Dev D but why it call it an adaptation if the story is as far away as it gets from the original work. Cast of the film is quite credible in the performances they have given before and the film will release on March 23.